Figure 1. The Philippine delegation led by Ambassador Lhuillier, DOT Director Niel Ballesteros, Tourism Attache Gerard Panga, pose at the Philippine pavilion with Ms. Universe Spain 2017 Sofia del Prado. Figure 2. 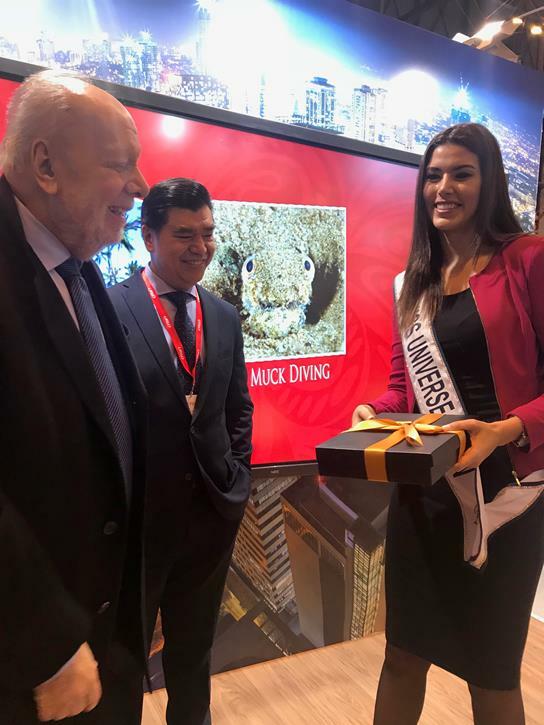 Ambassador Lhuillier and Consul General Emmanuel Fernandez thank Ms. Universe Spain 2017 Sofia del Prado for helping to promote Philippine tourism. Figure 3. Ambassador Lhuillier addresses the Philippine delegation to FITUR during the welcome dinner . 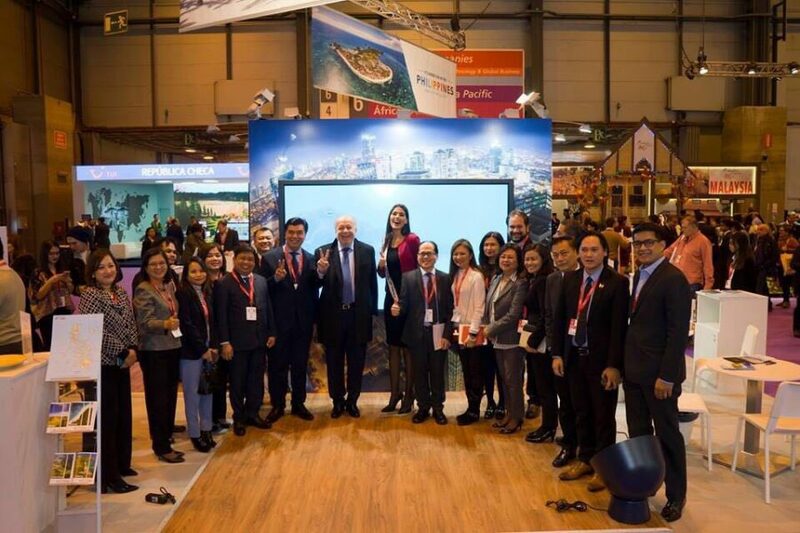 The Philippine pavilion, prominently highlighting various key destinations in the country, was a major attraction at the 38th edition of FITUR (Feria Internacional de Turismo), Spain’s biggest international tourism fair, held on 17-21 January 2018 at IFEMA, Madrid. Led by Director Niel Ballesteros and Tourism Attaché Gerard Panga from the Department of Tourism offices in Manila and London, respectively, as well as Ambassador Philippe J. Lhuillier and other officers of the Philippine Embassy in Madrid, the Philippine delegation was composed mainly of tour operators and executives from high-end, luxury resorts in Bohol, Palawan, and Boracay. Decorated in neutral-colored, weave patterns, the pavilion also featured Ms. Universe Spain 2017 Sofía del Prado who enjoined her countrymen to travel to the Philippines. Also on hand to entertain visitors to the pavilion were an acoustic band flown in from the Philippines and award-winning flair bartender Daniel Barela. 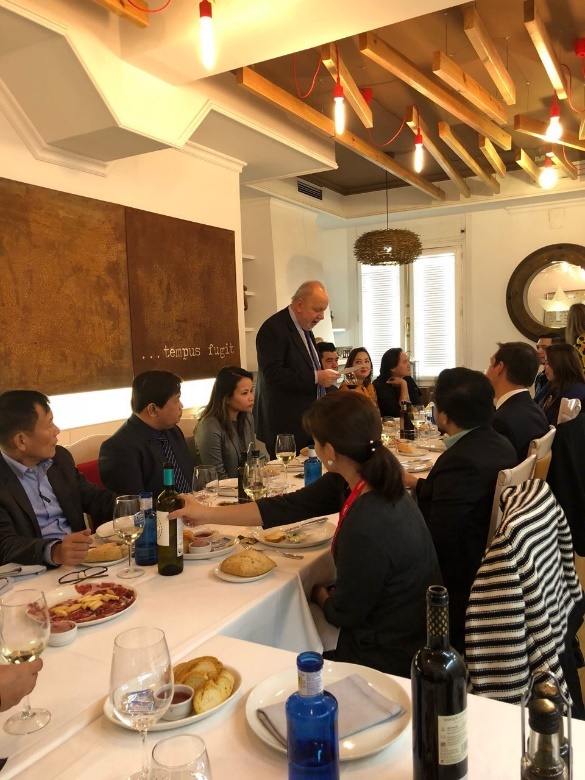 During the welcome dinner for the Philippine delegation to FITUR, Ambassador Lhuillier touted the event as a huge opportunity to exploit the Spanish market, highlighting the increased interest in the Philippines among Spanish people. He cited the number of visa issuances, tourism-related queries, monthly statistics on requests for Spanish-language tourism brochures, websites, and Spanish speaking tourist guides in the Philippines. FITUR serves as the biggest venue in Spain for international tour operators, with the latest edition seeing a record number of 251,000 visitors, a 2.5% increase from last year. The most commonly asked queries from potential tourists included visa questions, advice on destinations to visit, and safety. Spanish nationals may travel to the Philippines visa-free for 30 days. They are also asked to heed travel advisories from their Embassy in the Philippines, should there be any.